Better late than never: Albertine Sellers, Denver’s longest-serving employee, gets her 60-year pin. Denver rights a wrong with delayed but welcome recognition for feisty 82-year-old. 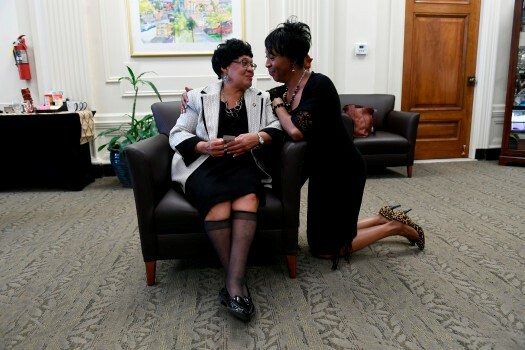 Albertine Sellers gets congratulated by her longtime friend LaTonya Lacy, right after be given a service pin to celebrate her 60+ years of service of working for the city in the Mayor’s office on March 9, 2017 in Denver. The pin was one year, four months and nine days late. Albertine Sellers was keeping track. Sellers marked her 60th anniversary of employment with the city of Denver in October 2015, but no one had ordered a 60-year service pin for the occasion. Instead she was given a 15-year pin. Big mistake, as anyone who knows the petite, 82-year-old Sellers can tell you. For a woman who is known by co-workers for her old-fashioned ways such as sending “thank you” notes and wearing pantsuits even on casual Friday, it was insulting and embarrassing. Albertine Sellers shows off her service pin for 60 years of working for the City of Denver on March 9, 2017 in Denver. When it comes to making things right, never underestimate the power of a woman who has the grit to catch a bus every morning and push her walker into the Wellington Webb Building. 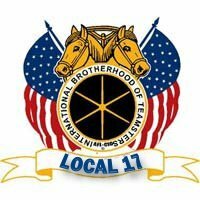 “She backs down to no one,” said Ed Bagwell, vice president of Teamsters Local 17. 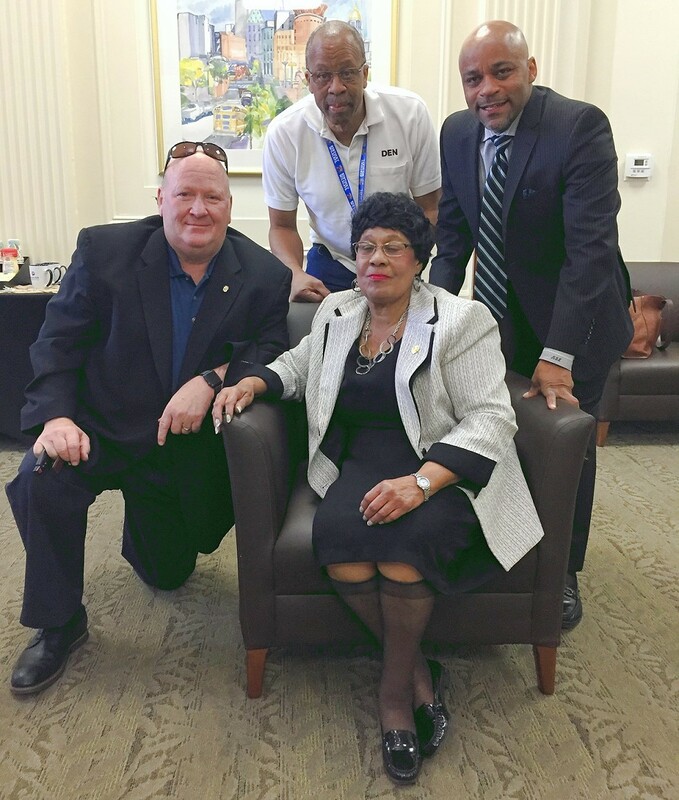 It may have taken nearly 17 months, but the city made up for its oversight on Thursday when Mayor Michael Hancock presented Sellers with a 60-year service pin during a ceremony in his office. No one else has ever worked as long for the city. 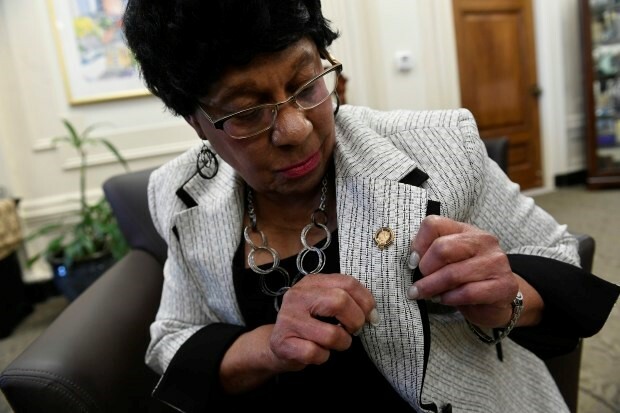 “This 60-year service pin is for me only,” a pleased Sellers said after the mayor pinned the black and gold badge with some sparkly bling on the lapel of her blazer. Sellers, a devout Christian who grew up in the Jim Crow South, lives on a foundation of faith, principles and hard work. And a promise is a promise. She also is a Teamster. Sellers is the first to call the Teamsters when she sees someone being treated unfairly at work, Bagwell said. If you’re smart, you’ll know well enough to treat her right. Sellers isn’t shy about telling you she feels disrespected by some supervisors in the city’s Office of Human Resources. Some days, no one gives her an assignment, which irritates a woman who believes in hard work and earning her keep. 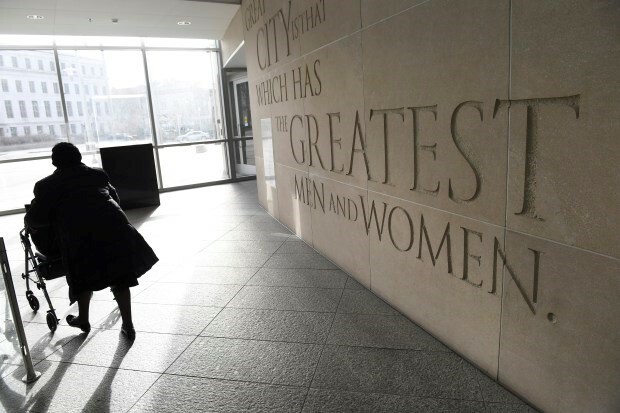 Albertine Sellers makes her way out of the Wellington E. Webb Municipal Office building on her way to the mayor’s office on March 9, 2017 in Denver. Bagwell shared Sellers’ disappointment when she was handed a 15-year service pin in 2015. He and the Teamsters pushed the city to order the 60-year pin — no matter how late. “To just hand someone a 15-year pin, it’s a hollow gesture,” he said. Sellers has said the pin didn’t really matter. She just wanted to be treated fairly and respectfully by her bosses. “On Oct. 15, 2015, God gave me a pin when he allowed me to work for the city for 60 years,” she said. Sellers, who grew up in Jackson, Miss., moved to Denver when she was 19 at the suggestion of teachers at her Catholic school. In October 1955, Sellers went to work as a nurse’s aid in the men’s ward at the city-owned Denver General hospital. For the past 34 years, Sellers has worked for the Career Service Authority. Sellers’ marriage ended in divorce years ago, and she never had children. She lives with two cats — Matthew and Precious, whom Hancock once met after driving Sellers home from a Bill Clinton speech in 2012. The cat “was anything but precious,” Hancock said as he began describing Sellers handing him an angry cat with its claws out and inviting him to hold it. “I was sitting there thinking, ‘There’s no way in the world I’m going to hold this cat,’ ” he said. Sellers shook her head at the story, later saying the mayor’s tale about Precious grows taller every time he tells it. The friends who had gathered for Thursday’s ceremony agreed it was about time Sellers received her pin and the respect she was due. Hancock closed the ceremony by noting that a 65-year service pin already had been ordered. “We’ll be here in 2020,” he said. This article was originally posted in the Denver Post at this location.